Many people said that if you don't have money and you need emergency assistance from hospitals, you will end up dead because there are many private hospitals in the country that demands an initial deposit before they cater patients even in a dangerous situation requiring immediate medical action. Your other option is government hospital that is often overcrowded of patients. But this thing may change in the future after the Senate approved on third and final reading the bill pushing for a "better and stronger" Anti-Hospital Deposit Law. The bill will impose stiffer penalties and fines on hospitals who will demand advance payment from emergency-case patients. The Senate Bill No. 1353 approved with 18 affirmative votes will amend Republic Act No. 8344. It also prohibits hospitals from refusing to confine or treat a person "to prevent death or permanent disability. "If hospitals will found guilty of demanding any deposit or another form of advance payment from the patients, a penalty of four to six years of imprisonment will be imposed. 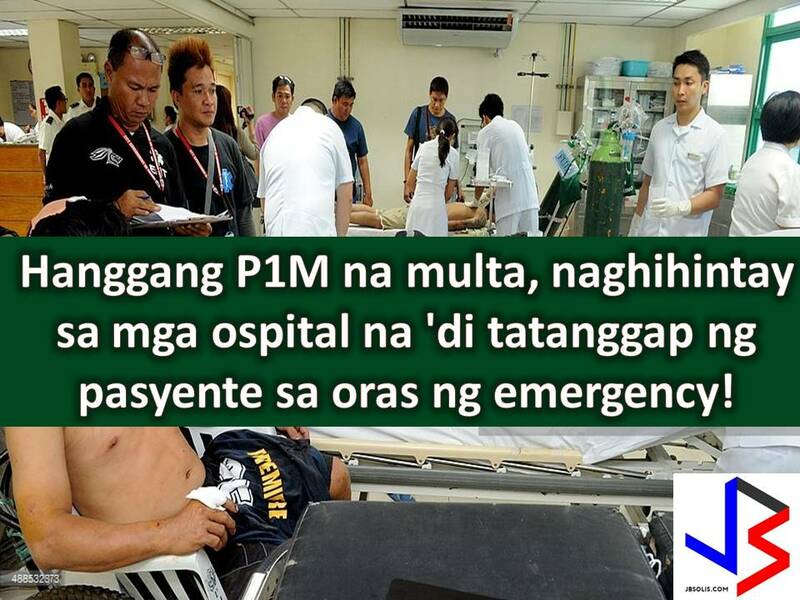 From 100,000, the fines for erring hospitals who refuse to administer basic emergency care will be P1,000,000. Aside from this, the bill will give authority to the Department of Health (DOH) to revoke the license of a health facility after three repeated violations. The bill also proposed to establish a "Sumbungan Board" or a Health Facilities Oversight Board under DOH. The Sumbungan Board will investigate patient complaints and facilitate the filing of cases in the court. Senator Risa Hontiveros is the author of the said bill. "We have come one step closer today to our vision of universal health. Harinawa, sa batas na ito, wala nang mahirap na itataboy ng ospital. Wala nang pagkakaitan ng serbisyong pangkalusugan," Hontiveros said. The House of Representatives has approved its counterpart measure on May 2. Because of this, both Senate and the Congress will convene into a bicameral conference committee to settle out the differences between the two version of the bill.